1 of 2 Heat oven to 400 degrees . Toss grapes with 1 tbsp thyme, the olive oil and 1/8 tsp salt. Place on a rimmed baking sheet; roast at 400 degrees for 40 to 50 minutes, shaking a few times, until wilted. 2 of 2 Mix ricotta and remaining 1 tsp thyme and 1/4 tsp salt. Spread 1 generous tbsp on each crostino. 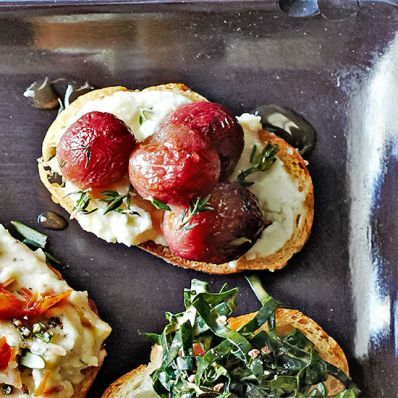 Scatter grapes on top and garnish with more thyme, if using. Drizzle with honey. 1 of 1 Slice a 12 oz baguette into 24 pieces. Brush with 1 tbsp olive oil and bake at 400 degrees for 8 to 10 minutes, until lightly toasted. Top with these three options. © Copyright Meredith Corporation. All Rights Reserved.